Ruthenium is a transition and noble metal with chemical symbol Ru and atomic number 44. 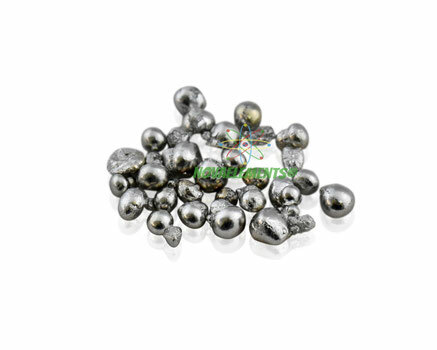 Ruthenium is the first of the platinum group metals. It is very hard and brittle and is commonly used in alloys and as a catalyst. Like with osmium, its tetroxide is very toxic, but ruthenium is less reactive than osmium. High purity solid Ruthenium metal pellets 0,5 gram in glass vial. Absolutely shiny surface, pure ruthenium metal sample.